Mildred Franks Worley, 97 of 1703 Coffee Rd. Westminster went to be with her Lord and Savior on Wednesday, Jan. 30th, 2019. She was born August 13th, 1921 in Franklin County Ga to Thomas and Effie Franks. She was married to the late Marvin Lee Worley, She was a retired spinner from the textile industry. Mildred was preceded in death by her spouse, Marvin Worley, sons, Kenneth E. Worley Sr., Clinton (Speedo) Worley, brothers, Doyle, Adger, Dennis, Alfred and Artis Franks. 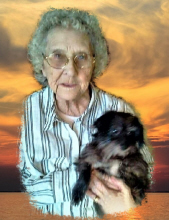 She is survived by daughter, Dorothy Holbrooks, brothers, Homer and Tommy Franks, grand-daughter raised in the home, Sonja Collins, 14 grandchildren, 28 great-grandchildren, her beloved dog “Little Girl”. Funeral Services will be held 10am Monday Feb. 4th, 2019 at the Brown-Oglesby Chapel with burial to follow in Pleasant Grove Baptist Church, Lavonia Ga. The family will receive friends from 5:00-7:00pm Sunday at the Brown-Oglesby Funeral Home. To send flowers or a remembrance gift to the family of Mildred Franks Worley, please visit our Tribute Store. "Email Address" would like to share the life celebration of Mildred Franks Worley. Click on the "link" to go to share a favorite memory or leave a condolence message for the family.